With dental implants, patients replacing missing teeth can enjoy a level of stability and attractiveness unmatched by other restoration options. While traditional dentures and bridges can shift during use, or cause discomfort while chewing, speaking and smiling, dental implants are designed to provide the stability and reliability of natural teeth. And, because dental implants support prosthetics that are individually crafted to match your natural teeth, the results are attractive as well as trustworthy. To learn more about dental implants, contact Dr. Maurice Edwards in New York, where his practice is conveniently located in midtown Manhattan. Dental implants allow patients to restore an attractive smile by anchoring lifelike dental prosthetics in the form of crowns, bridges, and even full sets of dentures. While traditional bridges require adjacent healthy teeth to be reshaped and reduced in size, dental implants do not rely on neighboring teeth for support, so more of your natural teeth remain untouched. Removable dentures can impair chewing ability and reduce taste sensation. Because dental implants are solidly secured, they have no effect on your palate, allowing you to eat and enjoy the foods you love. 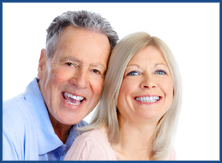 Dental implants are durable, and can last up to forty years with proper care. The placement of dental implants occurs over several visits to Dr. Edwards’ New York office. Because he holds an anesthesia certification, Dr. Edwards will be personally overseeing your comfortable sedation, which will occur as necessary prior to procedures. Dr. Edwards make a small incision in the gum in order to expose the underlying jaw bone. Once the bone is visible, he will create a hole in the edentulous jaw site using a dental drill, in order to accommodate a titanium screw that will act as the new tooth root. Once the screw has been carefully implanted in the jaw bone, gum tissue will be replaced, and sealed around it with sutures. Over the next two to six months, as the surgical site heals, the titanium post will osseointegrate with the jaw bone. After several months, when your mouth has healed from the placement of the titanium implant post, you will return to have Dr. Edwards attach the abutment to the post. When a realistic replacement tooth is place atop the implant post, the abutment is the metal device that will serve as an anchor, securing it discreetly below the gum line. Because it takes time to carefully craft a replacement tooth that matches the shape, size and color of your existing teeth, you may be fitted with a temporary crown until the prosthetic is ready. Several weeks later, the placement of your permanent dental prosthetic will mark the completion of your dental implant process. The confidence that comes from replacing a missing tooth with an attractive dental prosthetic is often reason enough for patients to choose dental implants. However, there are many health benefits to dental restoration as well. When a tooth has been lost or surgically extracted from the mouth, replacing the missing gap with a dental restoration is vital to the preservation of the function and appearance of the jaw. When a space is left unfilled, remaining teeth can shift, causing the jaw to become misaligned. Bacteria can become trapped in the open space, putting remaining teeth at higher risk of decay and eventual loss. And with no tooth to support, the jaw bone beneath the edentulous site may begin to deteriorate, allowing facial structure to become compromised. Replacing missing teeth preserves the function and integrity of the surrounding tissue, while restoring an attractive smile. Replacing missing teeth preserves the function and health of the mouth and jaw. If you are interested in attractive, reliable dental implants, contact Dr. Maurice Edwards in New York, where his Manhattan practice is dedicated to providing comfortable, cutting-edge patient care.